The Tuesday Literary Club and the Irish Embassy Pub were a match made in heaven when the former held its annual St. Paddy’s Day Party at the latter Tuesday night. About 18 members and associates attended for one of my favorite parties of the year. The Tuesday Lit ladies, as always, broke out all their green decorations for the festivities, and many guests wore scads of green beads collected over years of attending this party. It was a night of generations, which happens when a club has been in existence since 1938. Lucy Olson was on hand with her daughter, Joan Rhoades, both now associate members, and Christina Knickerbocker brought the newest addition to her family, her baby daughter, Elissa Talley Knickerbocker, for the festivities. Let’s just say the baby was not only the star of the festivities, her green onesie made a St. Patrick’s Day statement all its own. Betty Gale Hogan, who has been a member or associate member for decades – and I mean five or maybe even six decades – continued her attendance streak. It’s not just a party, though, it’s a fundraiser, with proceeds this year going to the Durango Education Foundation. The group holds a book auction, where attendees cull their collections for favorite reads and beautiful coffee table books to sell to their friends. Each person serves as the auctioneer for the books they are donating, which leads to much fun and frivolity. Elizabeth Testa, executive director of the beneficiary, attended the party. She got into the spirit of the evening, bringing a copy of Jackson Clark’s out-of-print Glass Photos and Wagon Ruts: Images of the Southwest by Lisa Updike and William Pennington to put on the auction block, so to speak. Longtime Tuesday Lit member Pat Emmett won the bid and will give it to her daughter, who owns a couple of Updike photos. Another book highlight was a coffee table book on Indonesian textiles, and donor Judy Wheeler included a beautiful intricate batik with the book. Grace Jensen auctioned off a book and notecards she made, and local authors were well-represented with offerings also written by Scott Graham and my predecessor at the Herald, Sally Morrissey. Her daughter Mary Thompson is also a longtime member of the club. The group also auctioned off two tickets to a Music in the Mountains concert, donated by the organization after Tuesday Lit designated its Christmas fundraiser proceeds for Music in the Mountains Goes to School. All told, the evening raised $650, so everyone, including Testa, went home with a smile. My thanks go to Nicki Massieon for serving as my correspondent on this story. 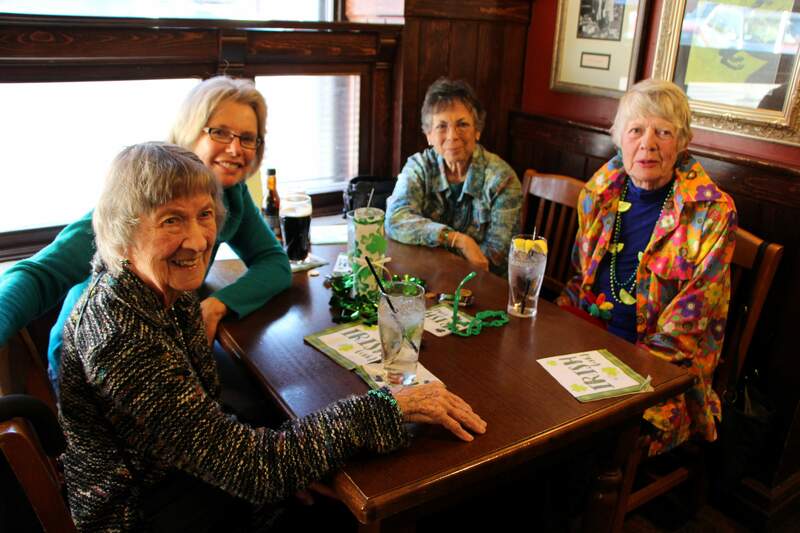 From left, front, Joan Rhoades and Betty Gale Hogan, and back, Grace Jensen and Lucy Olson, enjoy Tuesday Literary Club’s St. Paddy’s Day party at the Irish Embassy Pub on Tuesday. Hogan is the senior member of the club, and Olson and Rhoades are the second- and third-generation members from their family.